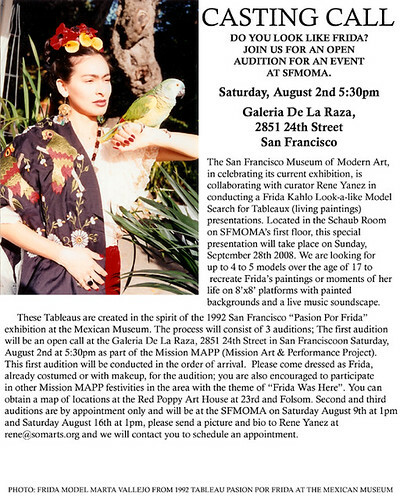 The San Francisco Museum of Modern Art, in celebrating its current exhibition, is collaborating with curator Rene Yanez in conducting a Frida Kahlo Look-a-like Model Search for Tableaux (living paintings) presentations. Located in the Schaub Room on SFMOMA’s first floor, this special presentation will take place on Sunday, September 28th 2008. We are looking for up to 4 to 5 models over the age of 17 to recreate Frida’s paintings or moments of her life on 8’x8′ platforms with painted backgrounds and a live music soundscape. These Tableaus are created in the spirit of the 1992 San Francisco “Pasion Por Frida” exhibition at the Mexican Museum. The process will consist of 3 auditions; The first audition will be an open call at the Galeria De La Raza, 2851 24th Street in San Francisco on Saturday, August 2nd at 5:30pm as part of the Mission MAPP (Mission Art & Performance Project). This first audition will be conducted in the order of arrival. Please come dressed as Frida, already costumed or with makeup.